Dr. LaTonya Branham is a native of Dayton, Ohio. 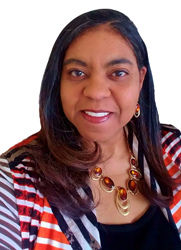 She is the author and editor of CultureSeek: Connecting to African and African American History (1st edition, 2006 and 2nd edition, 2009), Spirit Seek (2007), and The Academic Prayer (2013). She is also a two-time contributing writer to Chicken Soup for the Soul series: Devotional Stories for Women (2009) and Here Comes the Bride (2012). New releases are forthcoming in 2019. Dr. Branham is the founder and CEO of the Reader2Leader Foundation, and Branham Consulting. She is one of three co-founders of the Dayton Book Expo. In 2017, LaTonya received a Trailblazer Excellence in Arts Advocacy Award.